An evocation of the sounds of Bush House, formerly home of the BBC World Service, shortly before the building was handed back to its landlords. Yuri Goligorsky, formerly of the Russian Service, returns to the site of the Bush House dormitory, where night-shift presenters were offered a bed - although Yuri found the snoring unbearable. He also remembers one of the landmark programmes he produced - a phone-in with Prime Minister Margaret Thatcher, broadcast live to the Soviet Union. Hamid Ismailov takes one last look at the small office where he was once the first and - at that time - only Uzbek in the building, and Michael Goldfarb recalls the unique sound-world of the building, with its many languages, signature tunes, and hardened smokers. Between the Ears also hears Bush House memories from correspondent Mark Tully, Irini Roumboglou of the Greek Service, which was closed in 2005, and Najiba Kasraee, once of the Pashto Service. 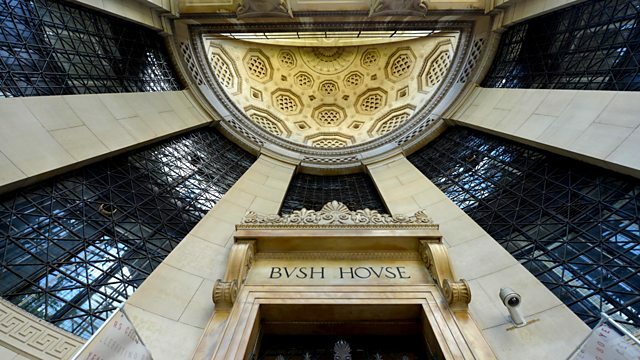 Bush House studio manager Robin Warren reveals how he captured and mixed the sounds of the building's marble stairwells, and composer and musician Matthew Herbert, now director of the BBC Radiophonic Workshop, reflects on Bush's unique sound world - and why it's vital to record it.